I haven’t been online much lately. My parents came for a four day visit which turned into a four week (almost) visit. Why the change of plans? Well, my dad ended up having surgery while they where here. Nothing too serious just somewhat unexpected. We are thankful to God all went well and they were able to head home yesterday. As it turns out, we have friends from Florida coming to visit tomorrow! We are SUPER excited! This will be their first time to visit us and Texas. You know how it is when you have had company….catching up on all the things you didn’t do while they were here. And you know how it is when you’re about to have company….cleaning, grocery shopping, getting everything ready. Yes, that’s exactly what’s been going on here for the last two days…..MAD cleaning, catching up on laundry and grocery shopping! I’m very grateful I have older children who are able to pitch in and help. Needless to say, I haven’t had a lot of time for cooking. I needed something quick and easy for dinner! While at the store this morning I picked up some Alaskan Cod. The cold water and natural environment of Alaska produces seafood with lean flesh, firm texture, and superior flavor that is full of high quality protein, vitamins, minerals and oils essential to good health. Alaska seafood is also low in saturated fat, low in sodium and one of the best sources of heart-healthy omega-3 fatty acids. 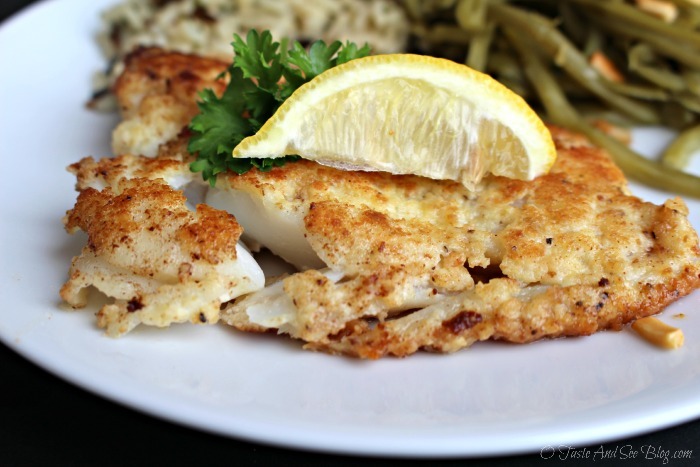 Cod is probably my favorite fish….light, flaky, very mild, nutritious and cooks quickly…,perfect for a busy weeknight dinner! Inspired by my most viewed post, I decided to make Parmesan Crusted Cod. Alaskan Seafood for all seasons!